The guests must be over 18 years to participate in the wine tastings. 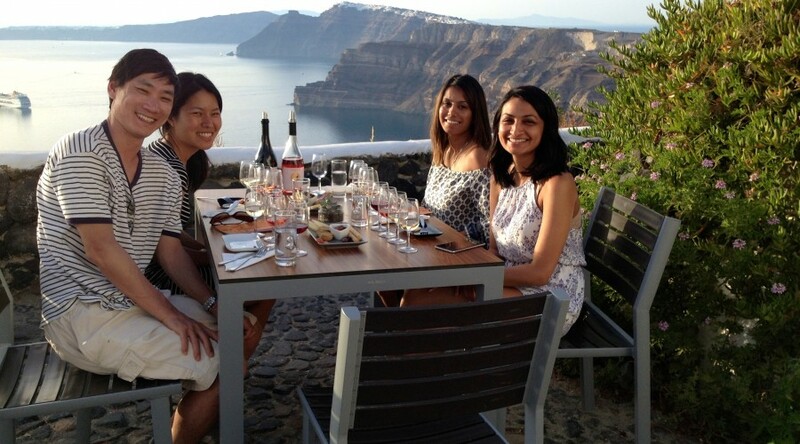 Visit 3 renowned, awarded wineries and taste all the types of terroir-driven wines of Santorini! Learn about the wine history of the island, the native grapes and the traditional and modern winemaking methods! Walk in an old, phylloxera-free, basket shaped vineyard and become familiar with the Santorini’s distinctive terroir! Enjoy a wine pairing with Cycladic cheese and local delicacies! With this wonderful 4-hour island tour you will get to visit 3 traditional wineries and taste all the types of different terroir-driven wines of Santorini. The whites from Assyrtiko, Aidani and Athiri grapes, the Nychteri, the sweet Vinsanto and the dryred Mavrotragano. While travelling by air-conditioned minibus you will have the chance to learn by your expert guide all about the wine history of the island, the native grapes and the traditional and modern winemaking methods. While touring around the 3 wineries. At one of the wineries you will enjoy a Cycladic cheese and wine pairing. Santorini has the most distinguishing terroir of Greece. The vineyard of Santorini is 3.500 years old and thus it’s considered to be one of the oldest vineyards of the planet! Moreover, it’s self-rooted that means that it has never been affected by the phylloxera, the insect which had destroyed the European vine roots in the late 19th century. The soil is of volcanic origin, porous, extremely poor in organic matters and full of minerals. Strong winds, lack of rainfall and high temperatures during summer make the life of vines difficult on the island. The vines absorb the water they need from the precious sea mist during spring and summer months, while they are trained in a basket shape with the aim to protect the grapes from the winds and the intense sunlight. This is an ancient pruning system that the locals call "kouloura" or "ambelia". There are more than 50 indigenous grapes on the island, but the white Assyrtiko dominates, accounting for about 80% of the vineyard. There is pick up / drop off service from most hotels. In case there is no car access to your hotel you will be advised of the closest meeting point, near to your hotel.